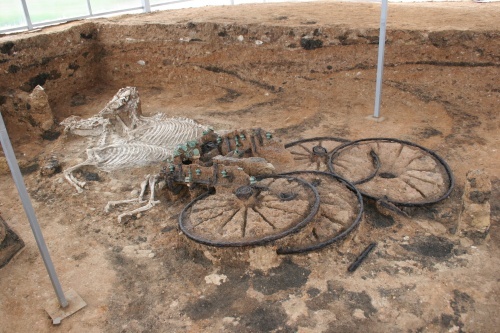 The four-wheeled wooden chariot, its intricately carved bronze plating and fittings, plus the skeletal remains of two horses and a dog have been preserved in situ instead of being removed to a museum. Thracian chariots were often buried with up to eight horses and their elaborately decorated bridles. The bronze plating features scenes from Thracian mythology, like the god Eros, a jumping panther and a mythological animal with the body of a panther and the tail of a dolphin. Four wheeled chariots are a very rare find, and this one is particularly notable because of the large diameter of the wheels: 1.2 meters, almost 4 feet. The Thracian nobleman himself was also found buried with his chariot, the animals and some wooden and leather goods thought to be horse harnesses. It’s not clear from the article whether he’s still on site along with the non-human remains, but I doubt it. The new complex was ceremonially opened by Deputy Culture Minister Todor Chobanov on Saturday, but it seems to have been sponsored by private corporations. I’m not surprised, given that the original dig was granted a total budget of $12,500 from the Bulgarian Culture Ministry. This entry was posted on Monday, June 28th, 2010 at 11:50 PM	and is filed under Ancient, Museums. You can follow any responses to this entry through the RSS 2.0 feed. You can skip to the end and leave a response. Pinging is currently not allowed. It is great to known the history. Thracian culture is extremely interesting.